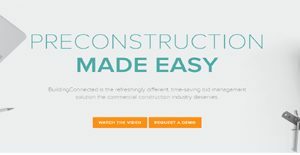 BuildingConnected is a web-based bid management software which caters to the construction related businesses as well the individuals such as contractors and subcontractors. Bidding process enables businesses to connect with the vendors and contractors, hence the process itself holds immense importance to the project management. With BuildingConnected, the bidding process has become digitized in a way that allows managing the bids from sending out RFPs or tenders to getting work orders approved. It is collaborative in a way that all stakeholders which ought to be in a bidding management loop can connect and collaborate with each other and ensure that effective bid management takes place. Successful bid management means that a project has acquired competitive contractors’ to carry out its procurement activities throughout the lifecycle of the project. BuildingConnected, as spelled out by its name, connects stakeholders to help organize and manage the entire procurement process from inviting bids to selecting suppliers and from issuing purchase orders to clearing the invoices. This all is done through the simple interface of BuildingConnected which connects the dots of every activity going during the procurement management workflows. It also allows enterprises to extract data based on daily reporting and monitoring conducted through its screen. Detailed information can be extracted such as the actions of the bidder, the performance of bidder, the quality of procured items, inspections of procured items, supplier relationship, costs and performance analytics. The ease with which the data is available makes BuildingConnected not just an easy to use but also a time-saving software solution. Overall, it brings automation in the entire system of the bid management. The bidding process is not like other processes which can be done openly, rather this process requires confidentiality management when it comes to sealing bids and NDAs. Therefore, contractors and subcontractors can send their bids in the electronic format without worrying about the security of the process. If you are interested in BuildingConnected it may also be beneficial to examine other subcategories of Best Construction Management Software collected in our base of SaaS software reviews. Organizations have diverse needs and requirements and no software solution can be perfect in such a condition. It is pointless to try to find a perfect out-of-the-box software product that meets all your business wants. The smart thing to do would be to modify the system for your unique needs, staff member skill levels, budget, and other factors. For these reasons, do not rush and invest in well-publicized trendy systems. Though these may be widely used, they may not be the best fit for your specific requirements. Do your research, check out each short-listed platform in detail, read a few BuildingConnected reviews, speak to the vendor for clarifications, and finally select the application that offers what you need. How Much Does BuildingConnected Cost? Building Connected offers a quote-based enterprise pricing model which comprises of features designed offered according to the business size and type of bid management. We realize that when you make a decision to buy Construction Management Software it’s important not only to see how experts evaluate it in their reviews, but also to find out if the real people and companies that buy it are actually satisfied with the product. That’s why we’ve created our behavior-based Customer Satisfaction Algorithm™ that gathers customer reviews, comments and BuildingConnected reviews across a wide range of social media sites. The data is then presented in an easy to digest form showing how many people had positive and negative experience with BuildingConnected. With that information at hand you should be equipped to make an informed buying decision that you won’t regret. What are BuildingConnected pricing details? What integrations are available for BuildingConnected? If you need more information about BuildingConnected or you simply have a question let us know what you need and we’ll forward your request directly to the vendor.